This article gives you details about the Wimbledon venue for 2012 London Olympics which will be the tennis venue for 2012 London Olympics. More details about the location of the venue, events conducted in the venue etc are quoted in this article. Wimbledon venue is one of the oldest and famous tennis courts in the world. 2012 Olympics Tennis tournament is decided to be conducted in Wimbledon for 2012 London Olympics. Wimbledon venue is located in south west London, near Richmond Park and the World Heritage Site of Kew Gardens. There will be five events conducted in Wimbledon venue for 2012 London Olympics. Wimbledon venue is the home ground of All England Lawn Tennis and Croquet Club. 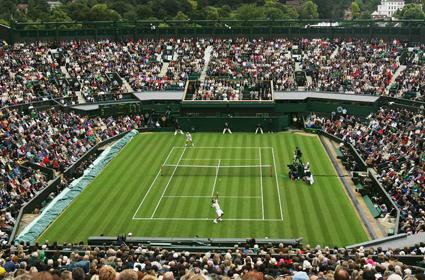 Wimbledon is one of the famous Tennis grass court in the world. After the Olympic Games Wimbledon will back to host many major grand slam tennis tournaments. Tennis competition in Wibledon venue will be held from 28th July to 5th August. More details about the Location of the venue, events conducted in the venue are given below.